The northern English town of Berwick upon Tweed, overlooking the North Sea in Northumberland. Berwick-upon-Tweed is a town in the county of Northumberland and is the northernmost town in England, on the east coast at the mouth of the River Tweed. It is situated 2.5 miles (4 km) south of the Scottish border. Berwick-Upon-Tweed, the former county town of Berwickshire, had a population of 11,665 at the time of the United Kingdom Census 2001. A civil parish and town council were created in 2008. Founded during the time of the kingdom of Northumbria, which was part of the Heptarchy, the area was central to historic border war between the Kingdoms of England and Scotland for centuries; the last time it changed hands was when England reconquered it in 1482. 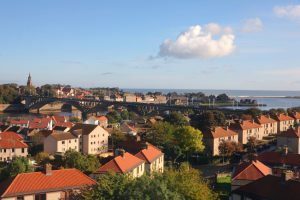 Berwick remains a traditional market town and it also boasts some notable architectural features, in particular its defence ramparts and barrack buildings. The origin of the town’s name is of Norse, or Old English, with the second element “wick” either coming from “vik” meaning a bay, or a “wic” meaning a settlement. The first element is also ambiguous, and may refer to either barley (baer) or the headland (“bar”) which cuts across the Tweed estuary. Another interpretation claims “Corn Farm” as the meaning of Berwick. Berwick was referred to as ‘South Berwick’ by the Scots, to differentiate it from the town of North Berwick, in East Lothian, east of Edinburgh. In the post-Roman period, the area may have been inhabited by the Brythons of Bryneich, who were in turn conquered by the Angles, who created the kingdom of Bernicia, which united with the Kingdom of Deira to form Northumbria. In either 973 or 1018 Northumbria north of the Tweed (known as Lothian) was ceded to Scotland. In 1018 the Scots defeated the Northumbrians at the Battle of Carham, which occurred across the River Tweed opposite Coldstream to secure possession of Lothian. Berwick station stands on the site of a historic medieval castle, where Robert Bruce’s claim was originally declined, and John Balliol’s accepted. Berwick’s strategic position on the English-Scottish border during centuries of war between the two nations and its relatively great wealth led to a succession of raids, sieges and take-overs. Between 1147 and 1482 the town changed hands between England and Scotland more than 13 times, and was the location of a number of momentous events in the English-Scottish border wars. One of the most brutal sackings was by King Edward I of England in 1296, and set the precedent for bitter border conflict in the Scottish Wars of Independence. In the 13th century Berwick was one of the most wealthy trading ports in Scotland, providing an annual customs value of £2,190, equivalent to a quarter of all customs revenues received north of the border. A contemporary description of the town asserted that “so populous and of such commercial importance that it might rightly be called another Alexandria, whose riches were the sea and the water its walls.” Amongst the town’s exports were wool, grain and salmon, while merchants from Germany and the Low Countries set up businesses in the town in order to trade. Berwick upon Tweed Town Hall. The Scots also had a mint at Berwick, producing Scottish coinage. In contrast, under English rule, Berwick was a garrison town first, and a port second. In around 1120, King David I of Scotland made Berwick one of Scotland’s four royal burghs, which allowed the town’s freemen a number of rights and privileges. In 1174, Berwick was paid as part of the ransom of William I of Scotland to Henry II of England. It was sold back to Scotland by Richard I of England, to raise money to pay for Crusades. It was destroyed in 1216 by King John of England, who attended in person the razing of the town with some barbarity. Edward I went again to Berwick in August 1296 to receive formal homage from some 2,000 Scottish nobles, after defeating the Scots at the Battle of Dunbar in April and forcing John I of Scotland (John Balliol) to abdicate at Kincardine Castle the following July. (The first town walls were built during the reign of Edward I.) The “homage” was not received well, and the Ragman Roll as it was known, earned itself a name of notoriety in the post-independence period of Scotland. Some believe it to be the origin of the term “rigmarole”, although this may be a folk etymology. An arm of William Wallace was displayed at Berwick after his execution and quartering on 5 August 1305. In 1314 Edward II of England mustered 25,000 men at Berwick, who later fought in (and lost) the Battle of Bannockburn. On 1 April 1318, it was recaptured by the Scots; Berwick Castle was also taken after a three-month siege. In 1330 “Domino Roberto de Lawedre” of The Bass, described as Custodian or Keeper of the Marches and the Castle of Berwick-upon-Tweed, received, apparently upon the termination of his employment there, £33.6s.8d, plus a similar amount, from the Scottish Exchequer. The English retook Berwick some time shortly after the Battle of Halidon Hill in 1333. In October 1357, a treaty was signed at Berwick by which the Scottish estates undertook to pay 100,000 marks as a ransom for David II of Scotland, who had been taken prisoner at the Battle of Neville’s Cross on 17 October 1346. On 3 February 1478 Robert Lauder of The Bass and Edrington was again appointed Keeper of the castle at Berwick-upon-Tweed with a retainer of £250 per annum. He continued in that position until the last year of Scottish occupation, when Patrick Hepburn, 1st Lord Hailes, had possession. In 1482 the town was captured by Richard Duke of Gloucester, the future King Richard III, although not officially merged into England. England has administered the town since this date. In 1551, the town was made a county corporate. During the reign of Queen Elizabeth I of England, vast sums — one source reports “£128,648, the most expensive undertaking of the Elizabethan period” — were spent on its fortifications, in a new Italian style (trace italienne), designed both to withstand artillery and to facilitate its use from within the fortifications. Although most of Berwick Castle was demolished in the 19th century to make way for the railway, the military barracks remain, as do the town’s rampart walls — one of the finest remaining examples of its type in the country. In 1603, Berwick was the first English town to greet James VI of Scotland on his way to being crowned James I of England – upon crossing Berwick Bridge, James is supposed to have declared the town neither belonging to England nor belonging to Scotland but part of the united Crown’s domain. In 1639 the army of Charles I faced that of General Alexander Leslie at Berwick in the Bishops’ Wars, which were concerned with bringing the Presbyterian Church of Scotland under Charles’ control. The two sides did not fight, but negotiated a settlement, “the Pacification of Berwick”, in June, under which the King agreed that all disputed questions should be referred to another General Assembly or to the Scottish Parliament. Holy Trinity Church was built in 1650–52, on the initiative of the governor, Colonel George Fenwicke. Churches of the Commonwealth period are very rare. The church has no steeple, supposedly at the behest of Oliver Cromwell, who passed through the town in 1650 on his way to the Battle of Dunbar. Berwick remained a county in its own right, and was not included in Northumberland for Parliamentary purposes until 1885. The Redistribution Act 1885, reduced the number of Members of Parliament (MPs) returned by the town from two to one. On 1 April 1974, the Borough of Berwick-upon-Tweed was created by the merger of the previous borough of Berwick-upon-Tweed with Belford Rural District, Glendale Rural District and Norham and Islandshires Rural District. The Interpretation Act 1978 provides that in legislation passed between 1967 and 1974, “a reference to England includes Berwick upon Tweed and Monmouthshire” (Monmouthshire is now fully in Wales). According to a poll conducted by a TV company, 60% of residents favoured Berwick rejoining Scotland. The issue is to be the centre of a new BBC comedy-drama series, A Free Country, commissioned in 2008 from writer Tony Saint. In 2009, the Borough of Berwick-upon-Tweed was abolished as part of wider structural changes to local government in England. 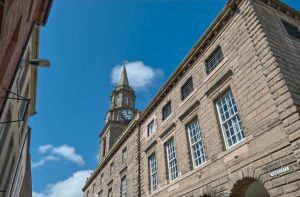 All functions previously exercised by Berwick Borough Council were transferred to Northumberland County Council, which is the unitary authority for the area. Berwick was originally the county town of Berwickshire, but from 1482 (when Berwick became part of England) to its abolition in 1975, Berwickshire had the unique distinction of being the only county in the British Isles to be named after a town in another country. After 1482, Berwickshire’s administration was conducted at Duns or Lauder until Greenlaw became the county town in 1596. When a county council was established in 1890 the county town once more became Duns. The Local Government (Scotland) Act 1973 incorporated Berwickshire into the Borders Region, which existed from 1975 until 1996. One of its four districts was named Berwickshire but was not identical in area to the county. The town of Berwick was a county corporate for most purposes from 1482, up until 1885, when it was fully incorporated into Northumberland. Between 1885, and 1974, Berwick (north of the Tweed) was a borough council in its own right, and then on 1 April 1974 it was merged with Belford Rural District, Glendale Rural District and Norham and Islandshires Rural District. During these periods, Berwick Borough Council and Berwickshire County Council (or District Council) existed, both named after the same town, but covering entirely different areas. The Borough of Berwick-upon-Tweed was abolished on 1 April 2009. From that date, Northumberland County Council assumed its functions, and those of the other districts in its area, to become a unitary authority. A new Berwick-upon-Tweed Town Council, a parish council, has been created covering Berwick-upon-Tweed, Tweedmouth and Spittal. It is expected to take over the former Borough’s mayoralty and regalia. Berwick-upon-Tweed is in the parliamentary constituency of Berwick-upon-Tweed. Slightly more than 60% of the population is employed in the service sector, including shops, hotels and catering, financial services and most government activity, including health care. About 13% is in manufacturing; 10% in agriculture, and 8% in construction. Some current and recent Berwick economic activities include salmon fishing, shipbuilding, engineering, sawmilling, fertilizer production, and the manufacture of tweed and hosiery. Berwick Town Centre comprises the Mary Gate and High Street where many local shops and some retail chains exist. There is a small supermarket in the vicinity too. A new office development is due to be built in the Walker Gate. There is a retail park in Tweedmouth consisting of some units. Berwick Borough Council refused a proposal from Asda in 2006 to build a store near the site, later giving Tesco the green light for their new store in the town, which opened on 13 September 2010. Asda went on to take over the Co-op shop unit in Tweedmouth early 2010. A Morrisons supermarket and petrol station, alongside a branch of McDonald’s and a hotel all exist on Loaning Meadows close to the outskirts of the town near the current A1. The old A1 road passes through Berwick. The modern A1 goes around the town to the west. The town is on the East Coast Main Line railway, and has a station. A small seaport at Tweedmouth facilitates the import and export of goods, but provides no passenger services. The local dialect, known as “Berwick”, has elements of Lowland Scots and the North East English dialect. The accent appears to be leaning more and more towards the south with each generation. The town is represented by Berwick Rangers F.C., who despite being located in England play in the Scottish Football League to make travelling shorter. The home stadium of Berwick Rangers is Shielfield Park. The town also has a rugby union side, Berwick RFC who play in Scottish Rugby Union’s National League Division One. Motorcycle speedway has taken place in Berwick in two separate eras. The sport was introduced to Shielfield Park in May 1968. A dispute between the speedway club and the stadium owners ended the first spell. The sport returned to Shielfield Park in the mid-1990s. The lack of a venue in the town saw the team move to a rural location called Berrington Lough. The team, known as The Bandits, have raced at all levels from First Division to Conference League (first to third levels). Berwick is unique for an English town in that both their football and rugby teams play their matches in the Scottish leagues, although at one point the Scottish town of Gretna used to play games in the English football leagues. There is a curious apocryphal story that Berwick is (or recently was) technically at war with Russia. The story tells that since Berwick had changed hands several times, it was traditionally regarded as a special, separate entity, and some proclamations referred to “England, Scotland and the town of Berwick-upon-Tweed”. One such was the declaration of the Crimean War against Russia in 1853, which Queen Victoria supposedly signed as “Victoria, Queen of Great Britain, Ireland, Berwick-upon-Tweed and all British Dominions”. However, when the Treaty of Paris (1856) was signed to conclude the war, “Berwick-upon-Tweed” was left out. This meant that, supposedly, one of Britain’s smallest towns was officially at war with one of the world’s largest powers – and the conflict extended by the lack of a peace treaty for over a century. The BBC programme Nationwide investigated this story in the 1970s, and found that while Berwick was not mentioned in the Treaty of Paris, it was not mentioned in the declaration of war either. The question remained as to whether Berwick had ever been at war with Russia in the first place. The true situation is that since the Wales and Berwick Act 1746 had already made it clear that all references to England included Berwick, the town had no special status at either the start or end of the war. The grain of truth in this legend could be that some important documents from the 17th century did mention Berwick separately, but this became unnecessary after 1746. Nevertheless, reportedly in 1966 a Soviet official waited upon the Mayor of Berwick, Councillor Robert Knox, and a peace treaty was formally signed. Knox is reputed to have said “Please tell the Russian people that they can sleep peacefully in their beds.” To complicate the issue, some have noted that Knox did not have any authority with regard to foreign relations, and thus may have exceeded his powers as mayor in concluding a peace treaty. However, Jim Herbert of the Berwick Borough Museum said in 2006 that contemporary newspaper reports did not confirm that a treaty had been signed, nor could Knox’s remark to the Soviet official be verified, presuming a Soviet official came to Berwick. Iain and Linda welcome you to The Kings Head Inn. We are proud of our history and our local links. Our central town location gives you the unique base for a stay on the glorious North Northumberland coastline.